CrowdStrike is the leader in cloud-delivered endpoint protection. Leveraging artificial intelligence (AI), the CrowdStrike Falcon® platform offers instant visibility and protection across the enterprise and prevents attacks on endpoints on or off the network. It seamlessly unifies next-generation AV with best-in-class endpoint detection and response, backed by 24/7 managed hunting. Its cloud infrastructure and single-agent architecture take away complexity and add scalability, manageability, and speed. CrowdStrike Falcon protects customers against all cyber attack types, using sophisticated signatureless AI and Indicator-of-Attack (IOA) based threat prevention to stop known and unknown threats in real time. A complete cloud-native framework to protect endpoints with ease: CrowdStrike’s Falcon Platform stops breaches with the power of big data, artificial intelligence (AI) and real-time visibility. 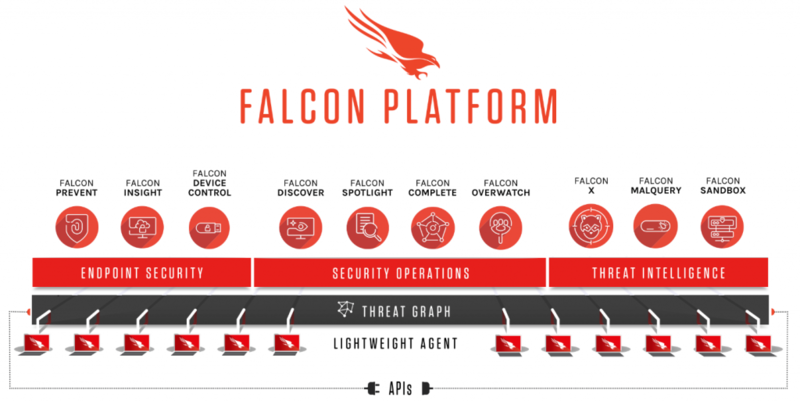 The Falcon platform delivers the foundation for true next-generation endpoint protection.